Let me begin by saying that I feel extremely fortunate to be living in an area not effected by floods and wild fires. Our hearts go out to everyone dealing with these devastating situations. Thru the tears and terror, we continue to witness courage, kindness, and a fierce determination to help strangers regardless of race, politics, or religion. The true American spirit always shines brightest when faced with adversity. Quilters embody that spirit in their generosity and compassion. We will all donate what we can to the many charities operating to help those in need. I know quilts are being made as we speak. We have spoken to our Apliquick shops in TX and they say it is too early to send quilts yet. The warehouses are not able to handle those types of supplies yet. I will keep on top of it and when we do have information, I will let you all know. IQA has posted this letter regarding the Houston show. First, we would like to thank all who have sent messages of support to us in response to the devastating flooding taking place in our home city of Houston. We are happy to report that all of our staff is safe, and that our office did not suffer any damages. Many others have not been so lucky, and we ask that you keep Houston and all areas that have been devastated by Hurricane Harvey in your thoughts, and, if possible, consider making a contribution toward organizations involved in the ongoing relief efforts. We have also heard from many people asking whether they should cancel their plans to attend this year’s International Quilt Festival in Houston. We want to assure you that there is no reason to cancel any travel plans, as the show is still scheduled to go on. The show is still over two months away, and we have full confidence that our city will bounce back quickly, as it has always done. Also, neither the George R. Brown Convention Center nor the Downtown Houston hotels were damaged in the flooding. At this time, our office remains closed, and will until it is safe for our staff to return to work. We will post an announcement to our website and social media when the office reopens. In the meantime, we ask that you be patient in receiving a response to any calls or emails. Once again, Quilt Festival in Houston is still scheduled to take place November 2-5 at the George R. Brown Convention Center. We hope you will plan to be there to support our amazing city and enjoy the show! In the last newsletter I asked you to send me photos that I could use for "Balance in Design." The quilt featured below by Lynne Rainen is a great example of balance; light areas and dark, large objects and small scale objects, warm colors and cool colors. The heavy rocks in the right foreground are well balanced by the cliffs and trees in the mid ground. Plan for balance in your compositions regardless of quilt style! 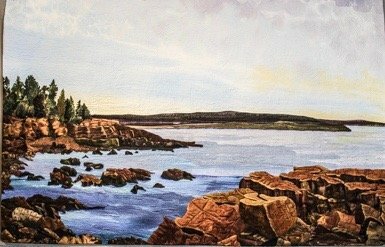 Some time ago, I wrote to ask your advice on a landscape quilt I was making from a photo of the Maine coast. Your advice was spot on, I took it, and I wanted to show you the resulting quilt. Thank you so much for your help and inspiration. I used all of the techniques you taught in your video class, and I was able to hand dye the sky since I didn't feel comfortable with piecing. The rocks and islands were all appliqued with Appliquick, and the highlights and shadows on the rocks and water were done with water soluble crayon. The whole thing was quilted using Superior MicroQuilter thread on a Pfaff Creative 3.0 home machine. Wow, look at the those rocks, such an outstanding job! Love the sky. It is so realistic. I bet you are happy with the depth you managed to capture too. Thank you so much for sharing it. If you are interested in learning more - my video/ on line iQuilt workshop, "Photos to Landscapes"
"All You Need is Love", my newest quilt, will be in the Paducah Show. Oh, the joys and fear of trying to depict love at 40 degrees below! This quilt has an amazing story of what can happen when you ask permission to use anothers' artistic work as inspiration for your quilt! Mrs. Schroeder, the founder of AQS, was intrigued enough by our story that they are publishing it in the Fall Show catalogue. But I want you to see a sneak peak! Last December the National Geographic Christmas catalogue arrived on my door step.The cover photo brought tears to my eyes. 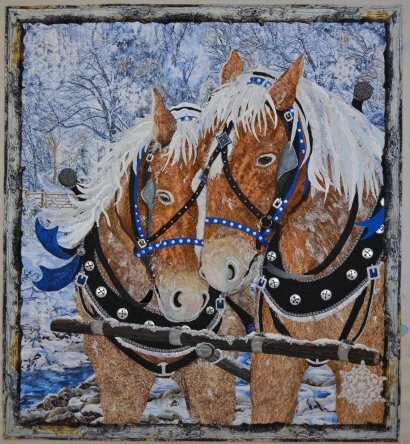 You all know my love of draft horses from my "Jingle Bells" quilt. The devotion of this team hit my heart like a sledge hammer. 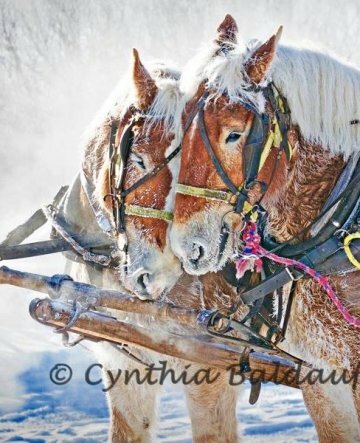 I ran to my computer in search of Cynthia Baldauf the photographer. I found her on Facebook and e-mailed her my instant connection to this photo, asking her what she would charge in royalties to use it as an inspiration for my quilted interpretation. Thus began a friendship (be still my heart) with a National Geographic photographer. As the quilt grew, so did our correspondence. 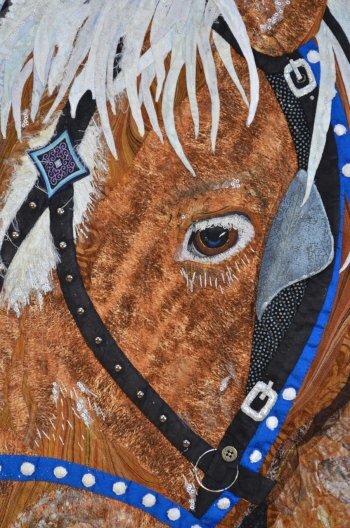 When it was finished, Cynthia and I collaborated on a story about the horses, learning about each other's art form and the joy of a new friendship. Click below to read the whole story and see the Paducah show book. Cynthia and I plan to meet in person for the first time at the Paducah show! Look for us both as we stand in front of our quilt on Preview Night and all day Wednesday. I can hardly wait. P.S. She used to be a nurse, too.